A Utopia is an imagined community or society that possesses highly desirable or nearly perfect qualities for its citizens. The opposite of a utopia is a dystopia. One could also say that utopia is a perfect "place" that has been designed so there are no problems. The notion of machines with human-like intelligence dates back at least to Samuel Butler's 1872 novel Erewhon . 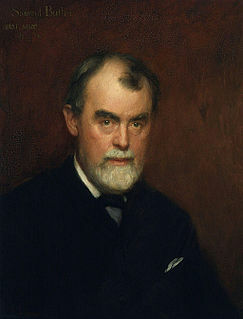 Samuel Butler was the iconoclastic English author of the Utopian satirical novel Erewhon (1872) and the semi-autobiographical Bildungsroman The Way of All Flesh, published posthumously in 1903. Both have remained in print ever since. In other studies he examined Christian orthodoxy, evolutionary thought, and Italian art, and made prose translations of the Iliad and Odyssey that are still consulted today. He was also an artist. Erewhon: or, Over the Range is a novel by Samuel Butler which was first published anonymously in 1872. The title is also the name of a country, supposedly discovered by the protagonist. In the novel, it is not revealed where Erewhon is, but it is clear that it is a fictional country. Butler meant the title to be understood as the word "nowhere" backwards even though the letters "h" and "w" are transposed. The book is a satire on Victorian society. A self-replicating machine is a type of autonomous robot that is capable of reproducing itself autonomously using raw materials found in the environment, thus exhibiting self-replication in a way analogous to that found in nature. The concept of self-replicating machines has been advanced and examined by Homer Jacobsen, Edward F. Moore, Freeman Dyson, John von Neumann and in more recent times by K. Eric Drexler in his book on nanotechnology, Engines of Creation and by Robert Freitas and Ralph Merkle in their review Kinematic Self-Replicating Machines which provided the first comprehensive analysis of the entire replicator design space. The future development of such technology is an integral part of several plans involving the mining of moons and asteroid belts for ore and other materials, the creation of lunar factories, and even the construction of solar power satellites in space. The possibly misnamed von Neumann probe is one theoretical example of such a machine. Von Neumann also worked on what he called the universal constructor, a self-replicating machine that would operate in a cellular automata environment. Irving JohnGood was a British mathematician who worked as a cryptologist at Bletchley Park with Alan Turing. After the Second World War, Good continued to work with Turing on the design of computers and Bayesian statistics at the University of Manchester. Good moved to the United States where he was professor at Virginia Tech. Max Erik Tegmark is a Swedish-American physicist and cosmologist. He is a professor at the Massachusetts Institute of Technology and the scientific director of the Foundational Questions Institute. He is also a co-founder of the Future of Life Institute and a supporter of the effective altruism movement, and has received donations from Elon Musk to investigate existential risk from advanced artificial intelligence. Existential risk from artificial general intelligence is the hypothesis that substantial progress in artificial general intelligence (AGI) could someday result in human extinction or some other unrecoverable global catastrophe. For instance, the human species currently dominates other species because the human brain has some distinctive capabilities that other animals lack. If AI surpasses humanity in general intelligence and becomes "superintelligent", then this new superintelligence could become powerful and difficult to control. Just as the fate of the mountain gorilla depends on human goodwill, so might the fate of humanity depend on the actions of a future machine superintelligence. Optimistic visions of the future of artificial intelligence are possible in science fiction. One of the best-known is Iain Banks's Culture series of novels, which portray a utopian, post-scarcity space society of humanoids, aliens, and advanced beings with artificial intelligence living in socialist habitats across the Milky Way. The android character Data in Star Trek: The Next Generation is another AI character in a utopian setting, but other intelligent robots rarely appear in the series. 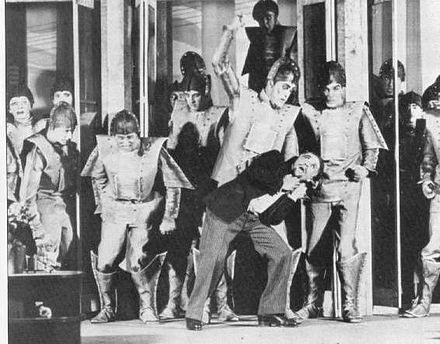 Robots revolt in Karel Čapek's 1920 science fiction play R.U.R. A common portrayal of AI in science fiction is the Frankenstein complex, a term coined by Asimov, where a robot turns on its creator. Fictional AI is notorious for extreme malicious compliance. For instance, in the 2015 film, Ex Machina , the intelligent entity Ava turns on its creator, as well as on its potential rescuer. Another well-known example of this is GLaDOS, the main antagonist in the Portal video games. A humanoid is something that has an appearance resembling a human without actually being one. The earliest recorded use of the term, in 1870, referred to indigenous peoples in areas colonized by Europeans. By the 20th century, the term came to describe fossils which were morphologically similar, but not identical, to those of the human skeleton. A friendly artificial intelligence is a hypothetical artificial general intelligence (AGI) that would have a positive effect on humanity. It is a part of the ethics of artificial intelligence and is closely related to machine ethics. While machine ethics is concerned with how an artificially intelligent agent should behave, friendly artificial intelligence research is focused on how to practically bring about this behaviour and ensuring it is adequately constrained. A gynoid, or fembot, is a feminine humanoid robot. Gynoids appear widely in science fiction film and art. As more realistic humanoid robot design becomes technologically possible, they are also emerging in real-life robot design. Robotics is the branch of technology that deals with the design, construction, operation, structural disposition, manufacture and application of robots. Robotics is related to the sciences of electronics, engineering, mechanics, and software. The word "robot" was introduced to the public by Czech writer Karel Čapek in his play R.U.R., published in 1920. 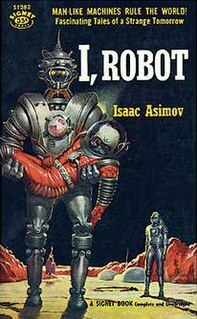 The term "robotics" was coined by Isaac Asimov in his 1941 science fiction short-story "Liar!" Machine ethics is a part of the ethics of artificial intelligence concerned with the moral behavior of artificially intelligent beings. Machine ethics contrasts with roboethics, which is concerned with the moral behavior of humans as they design, construct, use and treat such beings. 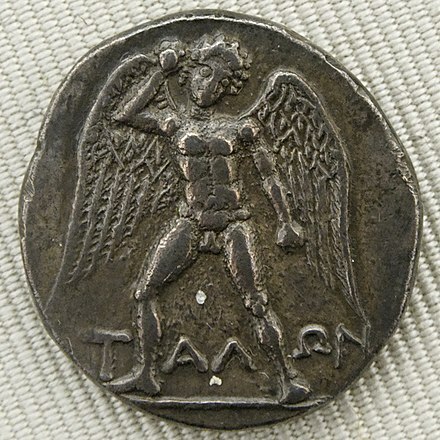 Machine ethics should not be confused with computer ethics, which focuses on professional behavior towards computers and information. It should also be distinguished from the philosophy of technology, a field that is predominantly concerned with the ethical standing of humans who use technological products, given that machine ethics regards artificially intelligent machines as actual or potential moral agents. AI takeover is a common theme in science fiction. Fictional scenarios typically differ vastly from those hypothesized by researchers in that they involve an active conflict between humans and an AI or robots with anthropomorphic motives who see them as a threat or otherwise have active desire to fight humans, as opposed to the researchers' concern of an AI that rapidly exterminates humans as a byproduct of pursuing arbitrary goals. 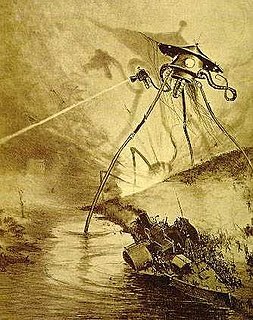 This theme is at least as old as Karel Čapek's R. U. R., which introduced the word robot to the global lexicon in 1921, and can even be glimpsed in Mary Shelley's Frankenstein, as Victor ponders whether, if he grants his monster's request and makes him a wife, they would reproduce and their kind would destroy humanity. Life 3.0: Being Human in the Age of Artificial Intelligence is a book by Swedish-American cosmologist Max Tegmark from MIT. Life 3.0 discusses Artificial Intelligence (AI) and its impact on the future of life on Earth and beyond. The book discusses a variety of societal implications, what can be done to maximize the chances of a positive outcome, and potential futures for humanity, technology and combinations thereof. Many scholars believe that advances in artificial intelligence will someday lead to a post-scarcity economy where intelligent machines can outperform humans in nearly every domain. The questions of what such a world might look like, and whether specific scenarios constitute utopias or dystopias, are the subject of lively debate. ↑ Butler, Samuel (2005) . Erewhon. Project Gutenberg. ↑ "Darwin among the Machines". The Press, Christchurch, New Zealand. 13 June 1863. ↑ Aldiss, Brian Wilson (1995). The Detached Retina: Aspects of SF and Fantasy. Syracuse University Press. p. 78. ISBN 978-0-8156-0370-2. ↑ McCorduck, Pamela (2004), Machines Who Think (2nd ed. ), A. K. Peters, ISBN 1-56881-205-1, pages 4-5. ↑ Poole, David; Mackworth, Alan; Goebel, Randy (1998). Computational Intelligence: A Logical Approach. Oxford University Press. p. 1. ISBN 0-19-510270-3. ↑ Booker, M. Keith (1994). The Dystopian Impulse in Modern Literature. Greenwood Press. 1 2 Barkman, Adam (2013). Ashley Barkman; Nancy Kang, eds. The Culture and Philosophy of Ridley Scott. Lexington Books. pp. 121–142. ISBN 978-0739178720. ↑ I.J. Good, "Speculations Concerning the First Ultraintelligent Machine" Archived 2011-11-28 at the Wayback Machine (HTML), Advances in Computers, vol. 6, 1965. ↑ Eden, Amnon H.; Moor, James H. (2012). Singularity hypotheses: A Scientific and Philosophical Assessment. Springer. pp. 1–2. ISBN 9783642325601. 1 2 Tegmark, Max (2017). Life 3.0 : being human in the age of artificial intelligence. Alfred A. Knopf. ISBN 978-1-101-94659-6. OCLC 973137375. ↑ Banks, Iain M. "A Few Notes on the Culture". Archived from the original on March 22, 2012. Retrieved 2015-11-23. 1 2 Walter, Damien (16 March 2016). "When AI rules the world: what SF novels tell us about our future overlords". The Guardian . Retrieved 27 July 2018. ↑ Tim Madigan (July–August 2012). "RUR or RU Ain't A Person?". Philosophy Now. Archived from the original on 3 February 2013. Retrieved 24 July 2013. ↑ "Der herr der Welt (Master of the World)". New York Times . 16 December 1935. p. 23. ↑ Overbye, Dennis (10 May 2018). "'2001: A Space Odyssey' Is Still the 'Ultimate Trip' - The rerelease of Stanley Kubrick's masterpiece encourages us to reflect again on where we're coming from and where we're going". The New York Times . ↑ "The Humanoids (based on 'With Folded Hands')". Kirkus Reviews. 15 November 1995. Retrieved 27 July 2018. 1 2 Asimov, Isaac (1950). "Runaround". I, Robot (The Isaac Asimov Collection ed.). Doubleday. p. 40. ISBN 0-385-42304-7. This is an exact transcription of the laws. They also appear in the front of the book, and in both places there is no "to" in the 2nd law. ↑ Lorenzo, DiTommaso (November 1992). "History and Historical Effect in Frank Herbert's Dune". Science Fiction Studies . 19 (3): 311–325. JSTOR 4240179. ↑ Livingstone, Josephine (23 May 2017). "How the Androids Took Over the Alien Franchise". The New Republic. Retrieved 27 July 2018. ↑ Murphy, Shaunna (11 December 2014). "Could TARS From 'Interstellar' Actually Exist? We Asked Science". MTV News. Retrieved 27 July 2018. ↑ Olander, Joseph (1978). Science fiction : contemporary mythology : the SFWA-SFRA. Harper & Row. p. 252. ISBN 0-06-046943-9. ↑ Seth, Anil (24 January 2015). "Consciousness Awakening". New Scientist . ↑ Baumgartner, Alison (12 December 2013). "Throwback Thursday: 'The Last Question' by Isaac Asimov". ScienceFiction.com. Retrieved 27 July 2018. ↑ Asimov, Isaac (1994). I, Asimov: A Memoir. Bantam. p. 250. ISBN 055356997X. ↑ Siren, Sofia (January 2016). "Our Future is Artificial" (112). ClarkesWorld Magazine. Retrieved 27 July 2018. Wikimedia Commons has media related to Artificial intelligence in fiction .